Jingle Bell, Kettle Bell, Jingle all the way! So we all know now that Winter is here!! Yep, days have been long cloudy, cold, and rainy. We have finally caught up as far as seasons are concerned. During the summer we often are out and about 50% of the day and naturally burning calories and staying fit, but come winter we are all cozy and snuggled up in our homes, watching movies, and indulging in snacks and good home cooked hearty meals. In addition, the Happy Holidays add fuel to the fire with sink your teeth into Thanksgiving and Christmas meals!!! Sorry folks but, WINTER + HOLIDAYS brings WEIGHT gain because of this! With my busy schedule I had to figure how to shed the pounds and sculpt my body from my home and in my community. I would love to visit a gym daily, but its not that easy with a tight schedule. I found some workout videos from the wonderful Jillian, from biggest loser, and really think its working for me and it may work for you!!! All different sizes to fit your needs. Yikes, I have the 8 pound one! Smallest of the crew, lol. Kettle Bells can be done twice or more a week for 30 minutes at the least. Check out this video that I have and all the others offered by Jillian !! Go to Amazon: http://amzn.com/B003TJM69C and purchase yours today! Check out Groupon for really good deals, They once had 4 sets of her videos to buy at once for only 20 bucks! – It burns more calories in 30 minutes (606 calories, to be exact) than 30 minutes of cardio kickboxing plus 30 minutes of spinning combined (531 calories total). 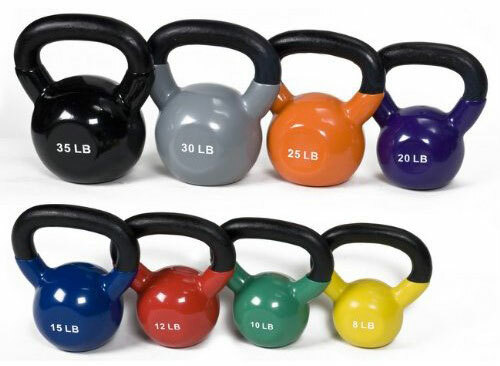 -The American Council of Exercise recently studied the benefits of the kettlebell and found that in eight weeks people could increase their cardio fitness by 17 percent. -There was also a 13.8 percent increase in aerobic capacity and the most dramatic increase came in abdominal core strength, which was boosted by 70 percent. Previous Post Tis the Football Season !